2015 looks to be a significant year for the Leo sun sign. You have the spent last several years doing what was expected of you and now it is time to pursue your own happiness. The 2015 Leo horoscope predicts that this is good time to make those big life decision’s whether it be buying a home, getting married or starting a family. This is the time to concentrate on yourself and to figure out what would make you happy in the long-term. This year your focus should be on your favorite person: yourself. It’s okay to be self-focused this year because it’s time to look after your own happiness, you deserve it! For the Leo, 2015 is a year of making big changes in your person life. This is the year to make your plans for the future a reality. 2015 will be a year of love, laughter and happiness for you, Lion. There will be challenges as well, but nothing that you can’t handle. Love and family are going to be your primary focus this year, forecasts the Leo 2015 love astrology predictions. This year is not so much about making new connections as deepening existing ones. If you are single, you may find that a friendship blossoms into love or something more or that you have a spark with a casual acquaintance. If you are already in a relationship, you will feel drawn closer to your partner. You will likely be about to make some big changes in your relationship. 2015 is an ideal time to take a relationship to the next level or to start or expand your family. 2015 will be a very personal year for the Leo star sign and because of that your career will take a bit of a back-burner this year. You will still strive to do your best. But you will be less inclined to take on extra projects this year as you instead focus on big changes in your personal life. Make the most out of this year both in business and career, warns the Leo business horoscope 2015. Big changes often mean big expenses, so money will be a bit more of a concern this year than in previous years, Leo. You are going to want to curb your tendency towards impulse purchase and save your money for the big things. According to the Leo money astrology forecasts for 2015, you may find that money is tight for the short-term, but the rewards you gain in the long-term will go well beyond the material. If you are considering big life changes, the 2015 Leo health zodiac analysis warns you want to make sure you are physically and mentally ready for them. This is the time to watch what you are eating and to try and establish a good routine. Mental care is just as important as physical health this year Leo and you may want to consider taking up yogasana or meditation to help you de-stress. Your home and family will be very important to you in 2015, Leo. If you are currently renting, this may be a good time to consider purchasing your own home or upgrading your current home. If you are happy where you are, you may want to turn your attention to renovations or adding a few personal touches. Your home is your kingdom and you want it to reflect your true self. Leo horoscope 2015 foretells that big changes that life will bring your way in 2015 will bring their own self-improvement. Be it planning a wedding, preparing for a new family member or changing your surroundings. You will be exposed to new experiences that will enrich your life. This will be a very emotional rewarding year for you and you should take the time to enjoy it. There is scope to travel to another country for business. It is also an excellent year to go on a vacation to a new exciting place with your family. You can also get a detailed Chinese horoscope 2015 analysis for the Leos. The year will start off with a focus on self-improvement and expression. In January all your planets will help you improve your career and business. Do not think too much about family this month. 2015 February too will be a busy month with respect to career and work. You might even get a pay hike or promotion. In March, you should be really focusing on your creative side, which is at its peak. This will be a good month financially. Love will also be satisfactory. You will be seeing the benefits of your creative boom through April. This is the month to build your dreams. Spend time with your loved ones. May might be a difficult month. You will face some obstructions when it comes to family, finance and career. By June you are ready consider other forms of self-expression and this is a good time to try and pick up a new skill or hobby. July will be a month where you need to take extra care of your health. Domestic issues will dominate this month. Career will take a backseat. 2015 will be an expensive year and by August you may be feeling the pinch. Just buckle-down and do your best to stay on budget. September will be a confusing month with respect to decisions on personal and professional front. Things should be back on track by the end of October, just in time for the holidays. Career will be in focus in November. You will need to balance your personal and work life with a lot of care. By December, your focus may start to shift away from your personal goals and back towards work. You will be thinking about where you want to go in 2016 and the specific skills that you will need to improve on. Your year of personal reflection will leap you feeling stronger, happier and ready to conquer the world. 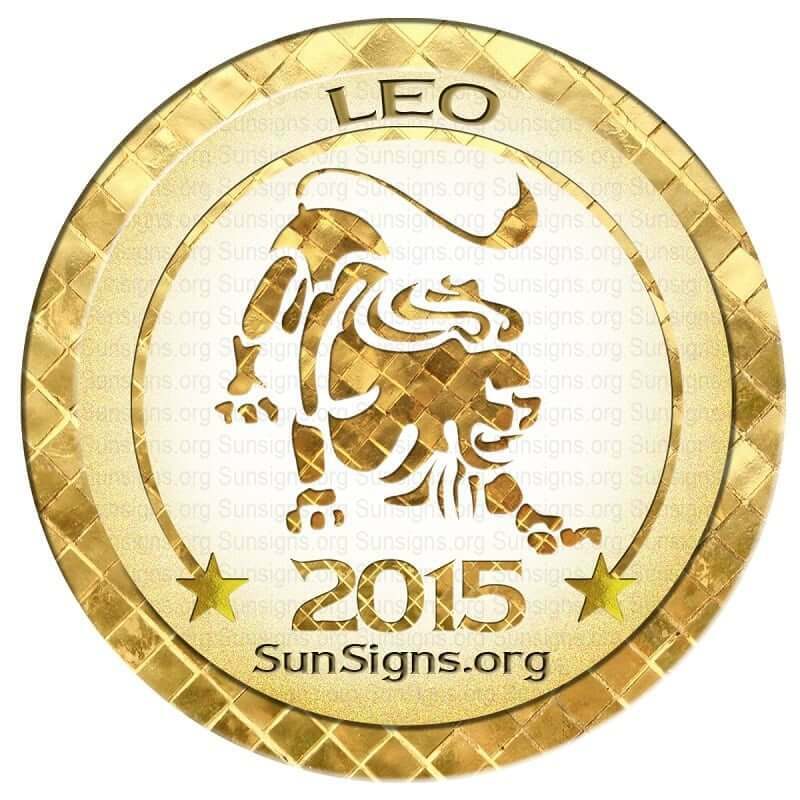 Overall 2015 will be a great year for the Leo sun sign. Concentrate on your positives and follow the Leo 2015 horoscope to make the most of the coming year.